WhatsApp is a great example of what users want in a mobile app. It’s easy to use, has a very clear value proposition as an instant message platform, is loaded with features for multimedia and group communication, and for 900 million users it has become one of the most convenient ways to communicate in a cheap, fast and effective way. There are some people however, who have decided to look beyond all this and add more functionality to WhatsApp. A group from India created a WhatsApp bot which allows its users to access certain services ordinarily accessible on the internet only and not through WhatsApp. After that services are accessed by typing specific commands as ordinary messages on group chat. For example Wikipedia searches can be prompted by typing Wiki followed by the search item, and sports news is available by typing certain reference numbers. You can get a more detailed account on how to use the bot’s features in this article. There’s a lot to be excited about with this service. Users are being offered additional access to the internet through an Instant Messaging platform. Features like Wikipedia searches will definitely amuse members of any group and access to information through news updates feels like a bonus for anyone accustomed to exiting WhatsApp and clicking on a web browser or a second and third app. The real victory is in minimising broadband use, something that Zimbabweans who use WhatsApp bundles to avoid the high cost of data will immediately appreciate. The bot becomes one workaround placed in another and WhatsApp becomes more than what it is. However, there’s more to this bot. One important thing to note is how this is one good example of spam bots. These are tools created for mass distribution of news and information which is inherently spam. Users of public platforms and chatrooms and groups will have likely encountered the odd, unidentified member who regularly posts information that has little to no relevance to the group. Since the WhatsApp bot was designed in India some of the news and information is for the Indian market, but it doesn’t end there. Your group will receive a deluge of information that will probably seem incoherent, something that ll spam is. The ugly side to this is that WhatsApp bots are also regular tools for phishing, something that will expose users to additional cyber risks which are definitely not worth the free Wikipedia or Ballon d’Or updates. If you choose to use and keep the WhatsApp bot even after experiencing some challenges with it like having to change the number after it stops working just remember there’s always a price attached to something free. This is a clever way of capturing thebdatabase of phone numbers in the world. Who knows if they are also sniffing and tracing conversations in our groups. This is a bit risky and should be blocked by Zuckerberg and his whatsapp team. In your whats app groups, Admins are tempted to add the so called wiki number. Besides capturing words like wiki and giving you answers, who knows if the system is also capturing words like, ‘Al qaeda’, ‘CIA’, etc and reporting numbers of whatsapp users and what the users are interested in. These guys are clearly collecting information from people while pretending to be useful. The funny thing is people do not think their information is of any value. this is a very powerful invention…. but i dont know hoe to use it.. also i dont know the different tags/commands can any one help me.? how to know ur wiki bot number? U can’t use the number without group? 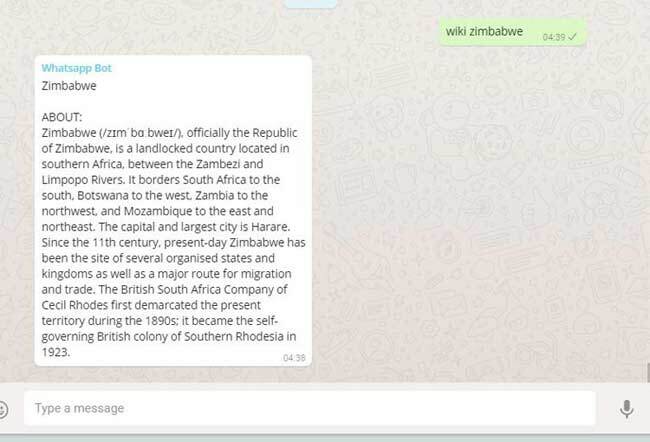 Its not official from whats app team,,, it could be used for hacking information.. avoid it till its confirm from Whatsapp Or Wiki pedia officially. 1. Save the above shared contact as Wikipedia to your phone. 2. Create a Group with any Groupname and add this contact (wikipedia) only. You are already another contact by default: so wikipedia and you (only 2 members) become the members. 3. Now you post in that group, anything textual to search in Wikipedia starting text with “wiki”. You must type: wiki SBI. 4. Wikipedia replies you in the group automatically. please add me to the group..
pls non of these numbers are working, I mean wiki…have they blocked all?..pls I need responses am mailing from Nigeria….u can as well give me any one you think is,working..
please I need the wiki contact that is working now…as I await for someone to help me with that….just send it to my number above….